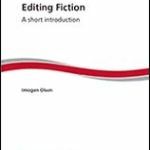 Some time ago someone asked on one of the Society for Editors and Proofreaders (SfEP) forums whether it is ever a good idea to do some proofreading or copy-editing for free. Much discussion ensued. Putting to one side for a moment the obligatory proofread of your offspring’s thesis or dissertation, your best friend’s offspring’s thesis or dissertation, or your elderly relative’s treasured autobiography, what is left? Why else might you work for nothing? The forum went on to list a number of possible reasons, and one of them was ‘because it might give you a warm glow’. I admit it: this suggestion was mine, and I made it because I speak from experience. Many, many (far too many) years ago I went to Denbigh Primary School in Luton and one of my teachers there was Mr Lyons. I mainly remember him because every Friday afternoon he would put aside whatever work we were supposed to be doing and read a story instead. One of the books he read to us over a period of some weeks or months was The Magic Door. Heard of it? I bet you haven’t. Long, long after I had left Denbigh Primary I remembered that I enjoyed listening to The Magic Door, and I tried to track down a copy. This was in the days before the internet. Ahem, it was even before the days of personal computers. I couldn’t find any trace of the book. My search wasn’t helped by the fact that I couldn’t remember who had written it. I tried again when Mr Google was born. Still failed. I moaned about it to anyone who would listen, then thought no more about it. Then several years later I got an email from someone I hadn’t been in contact with for ages. Amazingly, she had remembered me moaning, and by accident had found a site promoting the publication of The Magic Door. 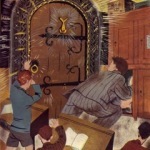 Excitedly I clicked on http://www.danbillany.com/books-by-dan-billany/the-magic-door. Try it now and you’ll see what I found. Needless to say, I bought a copy of the book. While I was about it I read about the author, Dan Billany, who disappeared in WWII and didn’t see the publication of The Magic Door, or indeed of the books he wrote during captivity in Italy. He and another prisoner escaped from prison but were never seen again. All this was jolly interesting, but I was anxiously awaiting my copy of The Magic Door. Would I still enjoy it? Would my eight-year-old son enjoy it? Or would it be hopelessly outdated, badly written and a terrible disappointment? It was some… er… forty or fifty years since Mr Lyons had read it out to my primary school class, after all. I couldn’t even remember much about the story itself, only that I had enjoyed it all those years ago. I needn’t have worried. I thoroughly enjoyed it, and so did my son – so much so that some of the phrases from the story have crept into our regular family usage. 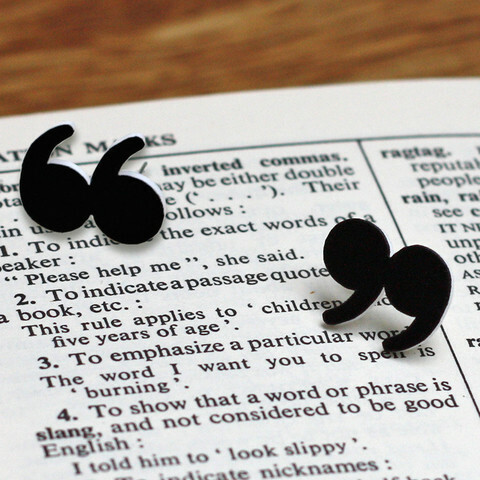 But as I was reading the book out to my family, I was puzzled to see lots of errors in the text – spelling and punctuation errors. How could this be? It had been a bone fide published book way back in 1943. I contacted Dan Billany’s great-niece (I think that’s the relationship), Jodi Weston Brake, to ask her what had happened. The answer was simply that there were no electronic versions of The Magic Door available, so she had had it rekeyed but couldn’t afford a proofreader. Now you can feel the warm glow coming. I offered to proofread the book for her, and explained why. She was delighted to hear the story of Mr Lyons, and sent me a pdf of the book (which was useful because at the time I was just teaching myself to edit pdf documents). I don’t know if a second edition has been issued, but if it has and it still has errors in it, they’re down to me. But don’t bother to write. One thing struck me as I was proofreading the book and warmly glowing: it is very definitely a boy’s book. It’s about the adventures of a class of boys in a boy’s school, and their adventures are… well, boyish. Of course ‘boy’s stories’ and ‘girl’s stories’ were just part of the landscape back then. Maybe that is a topic for another blog post. 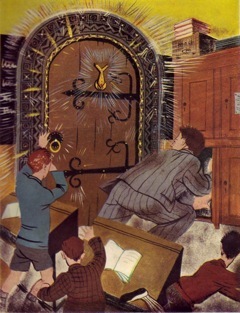 But I can recommend The Magic Door to anyone with a son aged about eight to ten, especially if you want to feed them some history on the sly. And I can definitely recommend warm glow proofreading. 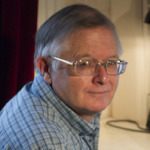 Stephen Cashmore is the training director and an advanced member of the SfEP. He lives on the west coast of Scotland, a stone’s throw from the beach, with his complicated family and not enough hours in the day. 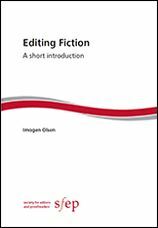 Proofread by SfEP associate Anna Black. This entry was posted in Freelance life and tagged free, pdf, proofreading, punctuation, spelling, story, working for free on December 23, 2014 by admin. The festive season is well and truly upon us. 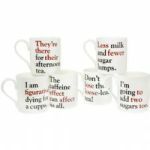 If you’re still stumped for gift ideas for the editor or proofreader in your life, then why not find some inspiration from these eleven suggestions? 1. 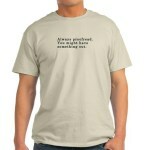 Proofread ash grey t-shirt £15.50 from CafePress. 2. 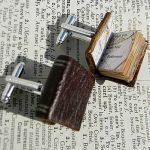 Leather book cuff-links £26 from Society of Little at www.notonthehighstreet.com. 3. 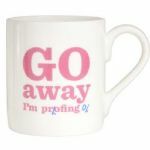 Keep calm travel/commuter mug £17.95 from Zazzle. 4. 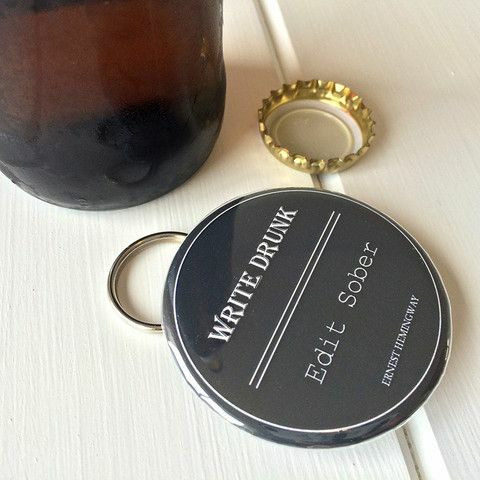 Bottle opener/keyring – write drunk, edit sober £4.99 from Book Lover Gifts. 5. 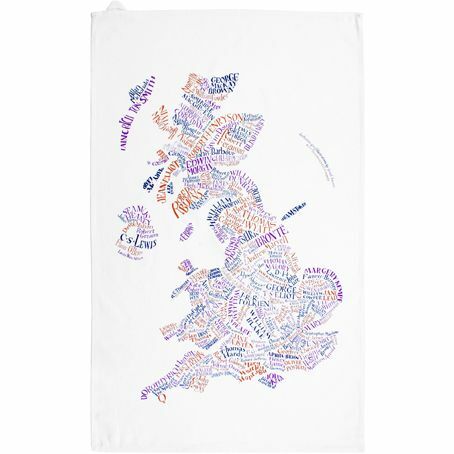 Literary Britain tea towel £8.95 from Present Indicative. 6. Go away I’m proofing mug £9.95 from The Literary Gift Company. 8. Set of six grammar grumble mugs £44.00 from The Literary Gift Company. 9. 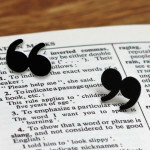 Quotation/speech marks earrings £5.99 from Book Lover Gifts. 10. 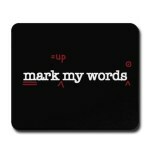 The editor mousepad £8.50 from CafePress. 11. One of a selection of the SfEP Guides £5 (or £4 for PDF version) from the SfEP online shop. 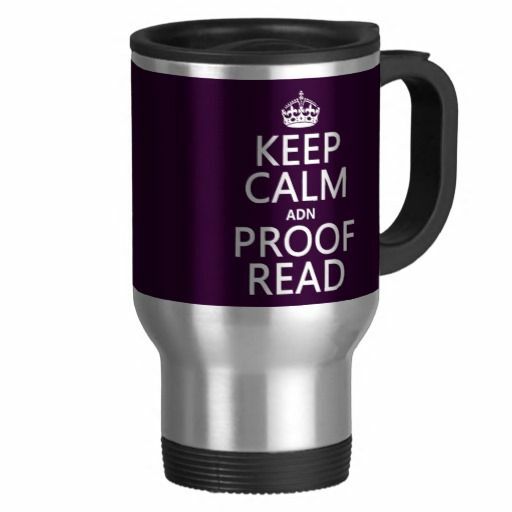 We’d love to hear about any gifts you’ve given or received that are particularly apt for an editor or proofreader. Joanna Bowery is the SfEP social media manager. 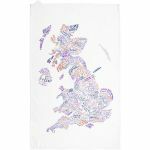 As well as looking after the SfEP’s Facebook, Twitter and LinkedIn accounts and the SfEP blog, she offers freelance marketing, PR, writing and proofreading services. 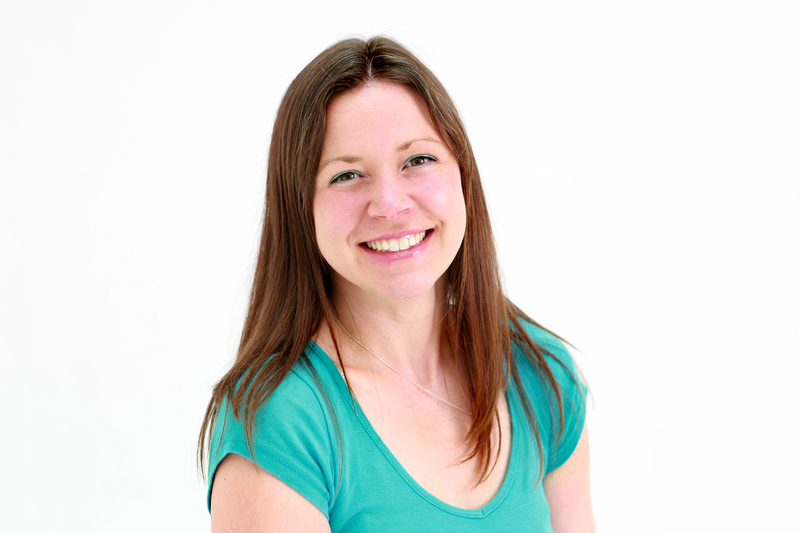 Jo is an associate of the SfEP and a Chartered Marketer. She is active on Facebook, Twitter, LinkedIn and Google+. Disclaimer: This list was created by the SfEP social media manager Joanna Bowery. Products listed here are not endorsed by the SfEP or Joanna Bowery and no payment has been received as a result of listing products in this post. Prices correct when this blog was posted. We cannot guarantee that all items are in stock. This article was proofread by SfEP associate Karen Pickavance. 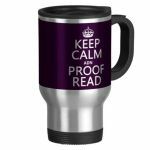 This entry was posted in Freelance life, In-house life, Just for fun and tagged Christmas, earrings, editors, gifts, grammar, mugs, proofreaders, SfEP guides, t-shirt on December 16, 2014 by admin. Social media moves very quickly, and the Society for Editors and Proofreaders (SfEP) Facebook, Twitter and LinkedIn feeds are no different. 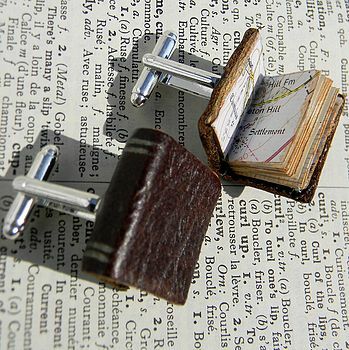 So, to ensure you don’t miss out, here’s a summary of our ten most popular posts in November. Joanna Bowery is the SfEP social media manager. As well as looking after the SfEP’s Facebook, Twitter and LinkedIn accounts and the SfEP blog, she offers freelance marketing, PR, writing and proofreading services operating as Cosmic Frog. 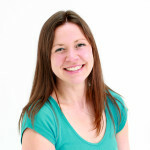 Jo is an associate of the SfEP and a Chartered Marketer. She is active on Facebook, Twitter, LinkedIn and Google+. 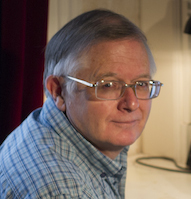 This article was proofread by SfEP associate Thomas Hawking. This entry was posted in Freelance life, In-house life and tagged editing, Facebook, LinkedIn, SfEP, social media, Twitter on December 9, 2014 by admin.